Thanks to our dedicated network of brand ambassadors and the sponsors that made our 2014 College Roadshow possible, there was very little work to be done on our end. Our “work” included road-tripping from college to college, throwing 350+ person parties. Needless to say, life is good. We started the Roadshow at Tulane. Whenever you get over 350 students to register for advance (and actually show up!) on Monday, you know something is being done right. We tip our hat to our impressive SquadUP brand ambassador team at Tulane including Stevie Schessel, Ali Perry, Kyle Davis, Tom Stern, and Ashley Clayton. And it’s official: The Boot is the best college bar in the country. Check out pictures from the event on our Facebook and Google+. The next stop was Nashville on a Tuesday, which is apparently a big night for Vanderbilt students and Sportsman’s Grille is the place to be. Big shout out to the owner, Brad, for being one of the nicest, most accommodating people we’ve ever met. It was great being able to join forces for our College Roadshow. The upstairs bar was packed and students had no problem cruising through the $1000 bar tab, even with the reasonably priced drinks. We posted pictures from the event to our Facebook and Google+. The Friday @ UDel was easily our wildest night. 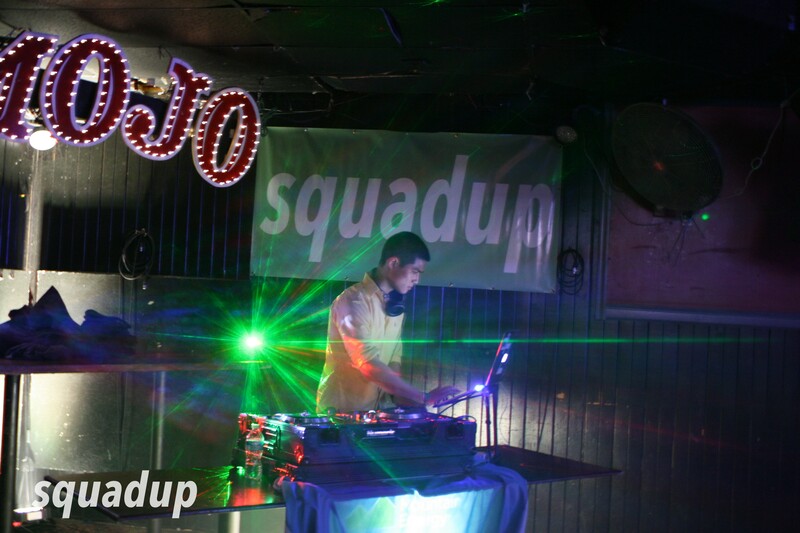 SquadUP and the girls of AZD transformed Mojo’s, typically known as a towny bar, into a classic college party. The bar said they’d never had that many people packed in the back room that turned into a mini rave scene. DJ Z had the whole room bumping and the laser show and smoke effects helped set the tone. You’ll see what we mean by the pictures posted to our Facebook and Google+. We finished off our week on the road (which directly followed our week at SXSW) at Villanova. We got the bar tab started early so students could come watch the Villanova take on former Big East rival UConn in some March Madness action. Unfortunately the Wildcats lost, but the party raged on. Share pics from the night by going to our Facebook and Google+. A big thanks to venmo, for depositing $5 into the venmo accounts of everybody that joins a SquadUP College Roadshow event. And of course to Sumeria– check them out, especially if you’re a senior about to enter the world of young professionals. And finally to Salesbus, thanks for contributing and helping to coordinate the Vanderbilt and UDel events. You were all a pleasure to work with. If you’d like your college to be our next stop, leave a comment or tweet @SquadUP. this site is real instructive! Continue putting up.